DONETSK, Ukraine -- A Ukrainian separatist leader is calling on Russia to "absorb" the eastern region of Donetsk after Sunday's referendum on self-rule. 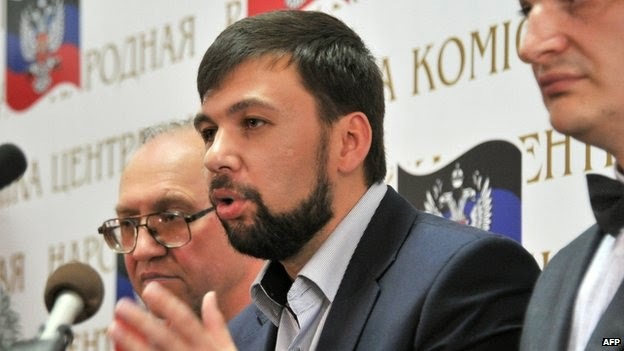 Rebel leader Denis Pushilin said Ukraine's presidential elections would not take place in Donetsk. Self-declared Donetsk People's Republic leader Denis Pushilin urged Moscow to listen to the "will of the people". In neighbouring Luhansk, where a vote was also held, rebels declared independence. Ukraine, the EU and US have declared the referendums illegal but Russia says the results should be "implemented". Moscow has so far not commented on the call for Donetsk to become part of Russia but has appealed for dialogue between the militants and Kiev, with the participation of the Organisation for Security and Co-operation in Europe. Russia annexed Ukraine's southern autonomous republic of Crimea after a disputed referendum in March and Kiev now fears its intentions in Donetsk, Luhansk and parts of southern Ukraine. NATO believes some 40,000 Russian troops are deployed near Ukraine's border, although Moscow says they have been pulled back. Separatists in Donetsk and Luhansk say 89% and 96% respectively voted in favour of "self-rule" in the referendums, held a fortnight before Ukraine's presidential elections. Ukraine's acting President Olexander Turchynov said the turnout for the referendum was much lower than the figure of 75% claimed by the rebels. "According to the Interior Ministry... about 24% of people eligible to vote took part in the so-called referendum the Luhansk Region and slightly over 32% in the Donetsk Region," he said. But Mr Pushilin said the 25 May vote, would not happen in Donetsk because it was now "independent". He added that he was not calling for Russian military intervention but that peacekeepers may be needed. The region would switch to the Russian currency, the rouble, he said. Earlier the head of the rebel Donetsk election commission, Roman Lyagin, said joining Russia "would probably be an appropriate step". Vasily Nikitin, a spokesman for rebels in the Luhansk region, said the Ukrainian presidential election would not be allowed to take place there after "independence". "The people of Luhansk Region declare the creation of a sovereign state - the Luhansk people's republic" said a statement released by rebels. The EU said it was imposing further sanctions over Russia's actions in Ukraine. Two Crimean companies and 13 individuals have been added to the sanctions list - the names are likely to be announced officially within the next 24 hours, reports the BBC's Chris Morris in Brussels. The sanctions impose travel bans and asset freezes. EU ministers are also discussing what might trigger a broader package of sanctions against the Russian economy. In a brief statement, the Kremlin denounced what it claimed had been "attempts to disrupt the votes, with the use of force, including the use of heavy weapons, against civilians", says the BBC's Steve Rosenberg in Moscow. Later Russia's Foreign Minister, Sergei Lavrov, said there were no plans to hold fresh international talks on the crisis - he accused the West of an "information blockade" over events in Ukraine and of "shameless lies". Earlier, Ukraine's acting president told Ukraine's parliament that "the farce that terrorist separatists call a referendum is nothing more than propaganda to cover up murders, kidnappings, violence and other serious crimes". Rinat Akhmetov, one of Ukraine's wealthiest businessmen, said he was convinced that the Donetsk and Luhansk regions would "only be happy in a united Ukraine". A number of towns in the two eastern regions refused to hold the referendums. They were held despite an earlier call for a delay by Russian President Vladimir Putin in order to create the conditions necessary for dialogue. What is President Putin's end game? Today's Kremlin statement on the referendums provides few clues. It is brief, calls for "dialogue" and peaceful "implementation" of the results of the vote. I would argue Moscow's objectives are clear: to retain influence in at least part of Ukraine, to ensure that not all of Ukraine embraces the European Union or - Russia's biggest nightmare - NATO. On Russian TV today, a prominent pro-Russia Ukrainian called on parts of eastern and southern Ukraine to form an independent state called Novorossiya (New Russia). Such a 'state' would inevitably be loyal to Moscow. So, is Novorossiya part of the Kremlin's long-term plan to retain influence in a large part of Ukraine? Or does Moscow's shorter-term strategy have more to do with derailing the upcoming presidential elections in Ukraine?